“They dug it, they laid the tracks, they ate in it, they urinated in it, they defecated in it, and some died in it. The life these men led was hard and brutal. Drink expelled the pain and suffering but it didn’t help their families who became dysfunctional”. 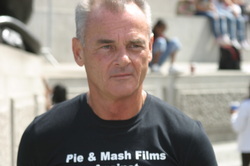 After acting opposite Colin Firth and Orlando Bloom and the success of his first feature films, Bill took the decision to walk away from a lucrative filmmaking career to utilise his skills to make campaigning documentaries focusing on institutional child abuse and the erosion of civil liberties. The trauma and abuse received in care, be it mental or physical, contributed massively towards the skills that this writer/director/actor/presenter would need to shoot the cutting edge, and controversial documentaries that are creating his signature around the world. His empathy gives license to survivors to tell their own stories freely, creating unsanitised, uncensored, engaging and electrically charged films. Bill’s life-turning point came at the age of 34 on a bitter January night in the early hours of the morning when an alcohol-fed undiagnosed ulcer erupted, almost bleeding him to death. That was 21 years ago. Since then Bill has developed his writing, acting, directing and presentation talents. These are best witnessed in his cutting edge films, and documentaries, some of which have won awards throughout Europe and America. Bill and his co-filmmaker Lilly Starr, have developed their style - charging in where angles fear to tread. They put the audience into their films as ‘the third eye’. Their highly energised banter and choreography gives their productions a definite new dimension. For further details or to arrange an interview please contact maria@pienmashfilms.com or Tel: 07710 416470.